Most employers want the print résumé to be brief: The usual recommendation, often strongly stated, is that the résumé should not be more than one page long (one side of an 8 1/2′ x 11″ page). Certainly entry-level job candidates (just out of college) should heed this length constraint. People in mid-career or applicants with extensive and/or various workplace experiences can consider having a résumé that is longer than one page. Conventionally, the résumé is a print document, produced with some word-processing application and mailed to the employer along with the job application letter. You might also FAX your print résumé to the employer (in which case you definitely need to include a FAX cover sheet). As a general rule, you should not send your résumé as an email attachment (e.g., a .doc file), especially to the uninterested reader. An uninterested reader is not likely to take the extra step of downloading the résumé file (or of accessing your Web résumé, if you send a URL). Plus, in the age of computer viruses, readers have to be suspicious of attached files coming from people they don’t know; that’s almost an automatic delete for an email! If an employer asks for résumés to be sent via email, then send the employer a plain-text résumé in the email message itself (not as an attachment). If the employer expresses an interest in having further information from you as a candidate, then you can follow up by sending the paper résumé by regular mail. Once you know that the employer has a keen interest in your candidacy and knows you, then you can probably send attachments. But don’t do that unless the employer says it’s OK. If you send an electronic résumé, try to also send a paper version (unless the employer expresses a desire not to have paper résumés). If at all possible you want the employer to have a paper version of your résumé on hand. format that information in a way that is compact (fits onto one page) and that highlights your strengths as a candidate. Conventionally, the résumé organizes information into easily scannable blocks: Contact Information, Education, Work Experience, etc. Within each block, you need to organize the information in such a way as to call attention to your best features. There are many different ways to format these blocks of résumé information. In the table below, the same chunk of information is formatted four different ways. Which formatting style is the most effective, do you think? And why? The first block of information isn’t résumé style: that is block paragraph format and you should not use that in your résumé. Résumé style #1 transforms the information from block paragraph style into list style, but doesn’t provide any visual emphasis or hierarchy. The information is still a blob of text, and that makes it hard for readers to scan. Style #2 cleans up the blob somewhat, by editing for conciseness. Style #3 creates more visual emphasis by putting the degree in bold and by indenting the second and third lines of information (i.e., the hanging indent), thereby calling more attention to the degree. Notice, too, that Style #2 and #3 represent the same information much more compactly than the other versions (fewer words overall, fewer lines). The other question here is information order. What is the most important piece of information for this candidate? Is it the name of the degree or the name of the university? Well, that’s a choice you can make depending on a number of factors. For instance, is the degree or the university more prestigious? (The answer to that question could vary depending on the job or the employer.) As a general principle of page design, you should position the most important information first, nearer the top, and toward the left on a page. Less important information should come second, nearer the bottom, and toward the right on the page. That is why in the examples above, the name of the degree or university comes first and the date of graduation (a necessary but relatively minor piece of information) is located to the right. Finally, let’s consider the question of design. How much “flair” should you have in your résumé? Below are three different designs of the name and address block of a résumé. Which do you think is most effective, and why? The first style above is how a résumé would have been designed in the typewriter age: plain text, with no other choice but ALL CAPS (or underlining) for emphasis. This style is definitely out of fashion for the computer-age, word-processed print résumé — but, ironically, that plain style has re-emerged as the preference for electronic résumés. (Caution: You would avoid the centering for an electronic résumé, because centering might not transfer electronically.). You would not want to use graphic style #2 or #3 above for an electronic résumé, because those styles have special fonts and formatting that would not translate well. However Styles #2 and #3 would be fine for a print résumé. They show two different, but generally effective, versions for formatting the same information. Both versions highlight the name and de-emphasize the contact information — that’s appropriate. Style #3 has a little more design flair, which is OK as long as it isn’t overdone. Your formatting and design should be consistent across all the blocks of information, from top to bottom on your résumé. The information within each block should be carefully aligned and consistently formatted, and the different blocks should be aligned with each other. Do not create competing styles or alignments from block to block. You have to decide which information to include in the résumé and which to leave out. Remember, less can be more. Avoid the tendency to include everything (also known as “padding” the résumé) because the more you include, the less any particular credential stands out. You want to call attention to your truly strongest credentials for employment, and not hide your credentials in a sea of data. You also want the résumé to look neat and be readable. You don’t want to cram so much information on the page that the reader is discouraged from looking at it. Your most relevant work experience related to your job objective. For mid-career applicants, the most important information is probably the job that you are currently holding. Mid-career applicants should probably list their work experience before education and that should be a much larger section than education (which might only be a line or two on the résumé). Name and Address · Basic contact information: name, address, phone number, email address.· Web url, if you have a Web résumé.· If you are moving soon (dorm and home, for example), include two addresses; always include date that you will change addresses. Entry-level management position in marketing or retail.Summer internship that allows me to apply my skills in writing, editing, and Web authoring. · Brief objective statement—typically one sentence or phrase:o What is your immediate objective for employment?o What kind of job are you looking for, in what kind of company, doing (generally) what kind of work? B.S. in Industrial Technology, Purdue University, West Lafayette, IN (exp. May 2009) · Title of your degree (B.A., B.S., M.S., etc. ), name of major, name of college or university, date of graduation (or expected graduation).· If you have attended more than one university, list them in reverse chronological order. List your highest degree first (M.S.before B.A., for example).· Certificates and special training. · GPA, if this is reasonably good (say, above 3.0). Don’t list only your GPA in your major unless it is truly exceptional; employers will assume that you have done well in your major. o If you have a truly exceptional accomplishment. o If the location of your high school might be relevant, as if your high school is in the same city as your prospective employer. o Indicate that additional information about “blanks” on your employment history will be supplied on request. (optional) · If you have two or more “honors,” you may want to include this as a separate section.· Include academic and civic awards and honors, significant scholarships based on merit, or other evidence of special accomplishment. (If your only honor is having made the Dean’s List once or twice, include this under Education rather than creating a separate section. (optional) · List any professional organization in your field to which you belong. (You may want to join the Society for Technical Communication, or STC.) Employers often appreciate evidence of professional activity.· Employers also look for a record of social and/or civic involvement. List other groups you belong to, especially if you hold a leadership role or perform a special function.· Include sports, music, theater or other extra-curricular activities only if you have won awards, held a leadership position, or been selected in high-level competitions. Personal Information · Most employers don’t care about personal information like hobbies, sports participation (unless you have something special to report) or religious affiliations—and in fact, some of this information can put employers in an awkward position vis a vis fair hiring practices.· Include salary expectations, willingness to relocate, willingness to travel, and other such information in your cover letter, not on your résumé. References · It’s OK to say “Available on request.”· If you want to include references, you may want to list names, titles, and contact information on a separate page.· Entry-level candidates typically list one or two academic references (professors) and one or two professional references (managers or supervisors). Family friends are probably not useful, unless they know you well and have some familiarity with the requirements of the position you are seeking. Let’s take a look at how one résumé writer has put this general advice into action. The art of writing a résumé is making your own decisions about information content (how much, how little, in what order), based on your own strengths. 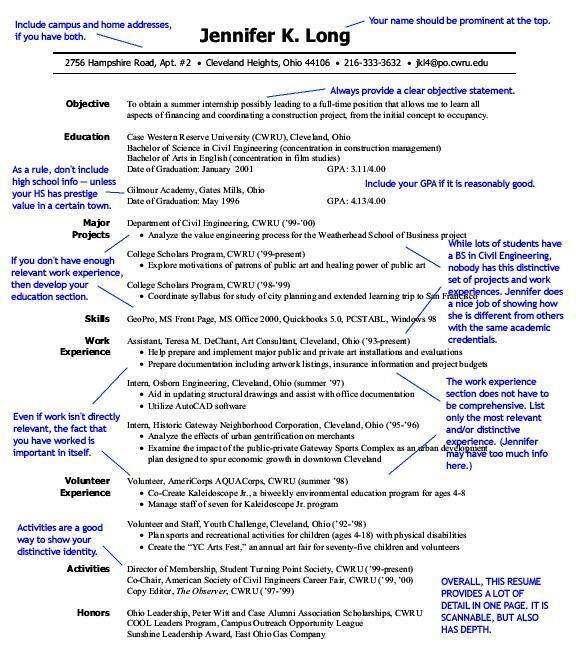 Below is Jennifer Long’s résumé for a summer internship in construction, along with descriptive and evaluative comments. Generally, this is an effective résumé, attractive and professional-looking. It provides a lot of information compactly, and it highlights Jennifer’s best credentials as a job candidate. The only question we would raise is whether Jennifer has too many blocks of information on the page. Too many different blocks can compete for the reader’s attention and thereby disperse emphasis. Any items you put in a list, whether a bulleted list or not, should be parallel grammatically. For an explanation, see the Purdue OWL discussion of parallel structure and parallel structure in business writing. For an exercise on faulty parallelism, see Principles–Correcting Style Problems. Most discussions of parallelism focus only on grammatical parallelism: that is, are the items in the list in the same grammatical form? But there is another important kind of parallelism: logical or conceptual parallelism. That type of parallelism asks, Do all the items in the list belong together logically? Is it a coherent list — or are some of the items “not like the others” (to quote Mr. Rogers)? See the table below for examples of faulty conceptual parallelism. Q1: Is this really four separate items, or two? Q2: Are these four items all “responsibilities”? Isn’t “working well with others” a job expectation? Posted in LUYỆN NGHE, LUYỆN VIẾT, TOÀN BỘ - ALL POSTS, TRÌNH ĐỘ B1 - B2, TRÌNH ĐỘ C1 - C2, Uncategorized and tagged all about CV writing, cách viết CV tiếng Anh, Cách viết resume bằng tiếng Anh, CV formats, CV samples, CV structure, English grammar, English writing, học tiếng Anh tại Hà Nội, how to write a good CV in English, how to write a good resume in English, luyện viết, résumé, Résumé style. Bookmark the permalink.